WEIXIN QUEK CHONG has won the Grand Prize of the 2018 President’s Young Talents Awards, which recognizes the practice of emerging Singaporean artists aged 35 and below. All images courtesy Singapore Art Museum. Visual artist Weixin Quek Chong, 30, received the $20,000 Grand Prize from President Halimah Yacob at the President's Young Talents awards yesterday at the Singapore Art Museum (SAM) at 8Q. 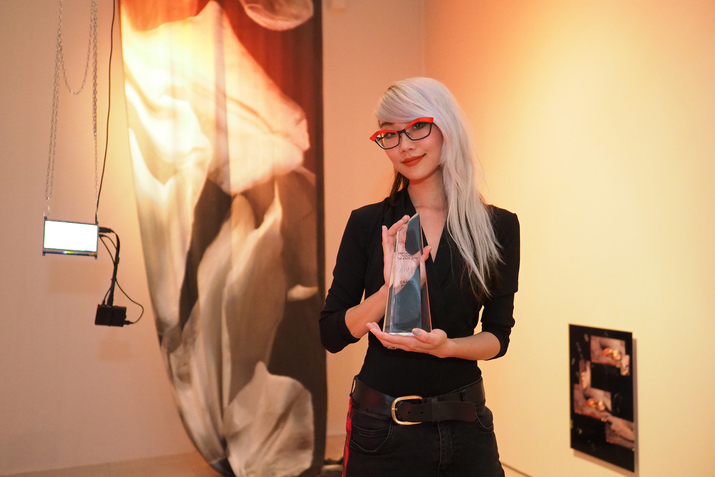 She was one of five finalists for the seventh edition of the prize, Singapore's only mentoring, commissioning and award programme for emerging Singaporean artists aged 35 and below. Her installation, titled sft crsh ctrl, makes use of materials such as silk twill, latex sheets and faux fur. It is being exhibited, together with the works by the other finalists, at the museum until Jan 27.